The best way to bring back a franchise is to reboot the way it has been presented so far, or so Paramount Pictures believes. After all, the studio has been the sole distributor for all Jack Ryan movies, and Jack Ryan: Shadow Recruit is the fifth in the series. Do not get fooled by the words "franchise" and "series", because Jack Ryan is a concept, as far as the movies are concerned. He is a character created by Tom Clancy, who passed away last October. The latest release, however, may just be the beginning of a more chronological series of films, or at least, that is the impression one gets. Jack Ryan (Chris Pine) serves in the US Marine Corps. When he is badly hurt in a helicopter accident in Afghanistan, he is forced to become bedridden. This is when he meets with CIA agent Thomas Harper (Kevin Costner). Harper is suitably impressed by Jack, and recruits him as an agent. Jack is sent back to college, where he completes his PhD in Economics. Many years later, he is placed by the CIA as a broker on Wall Street, from where he can keep a track on suspicious activity in the world of financial transactions. And he does discover one rather suspicious activity. Viktor Cheverin (Kenneth Branagh) was a part of the Soviet invasion of Afghanistan decades ago. He and his comrades want to avenge the insult they suffered when the USA decided to enter Afghanistan. Jack leaves for Moscow, as a broker, to audit Cheverin's accounts. Cheverin, however, is no idiot, and Jack has no idea what is in store for him. In the meantime, Jack's fiancée, Cathy (Keira Knightley), is convinced that he is having an affair, and so she follows him to Moscow. Tom Clancy first featured Jack Ryan in The Hunt For Red October, and enhanced his character in Patriot Games. While the makers of this film stick to the basic background for Jack, much has been adapted and upgraded to make the setting more relevant to present times. The screenplay is structured uniformly, with the right balance of action, suspense and drama. The romance is incidental. The dialogues are taut and witty, at times. While the threat is plausible, one cannot help but notice that solutions are too easily arrived at, but that can be overlooked, given the whole CIA factor. Of course, comparisons cannot be avoided (with the movies of the 1990s), but Jack Ryan: Shadow Recruit fares favourably, especially with the screenplay and the style. All this is valid only if you can ignore the fact that the movie has almost nothing to do with the books, except, as mentioned above, the characters and background. As a spy thriller, it has enough thrills, and as long as you remember that there is no need for an emotional attachment to any of the characters, you will enjoy it ??" pure intelligent masala fare. 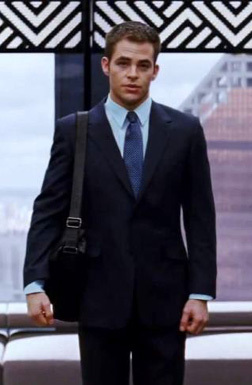 Chris Pine suits the character of Jack Ryan. He can be a bit mechanical at times, especially when he has to be grim and concentrate on the task at hand. Keira Knightley is arm candy, mostly, but she manages to hold her own. Kevin Costner is suitably dignified and serious. It is Kenneth Branagh, also the director of the film, who manages to steal the show as the antagonist. He is menacing and charming, and not somebody you would want to cross, even if he is a terrorist. The production design is a bit robotic ??" every detail is impersonal and perfect. It does not have a character of its own, although the Moscow scenes add some flavour. Cinematography, similarly, is almost perfect, but cold. The movie has been edited sharply, especially the action and thrill sequences. If you are a Tom Clancy fan, you may not find much to look forward to in the movie. However, Jack Ryan is a pretty outdated character, and the fact that he is now being made more contemporary is worth one look. Jack Ryan: Shadow Recruit is a typically American movie, where one gets doses of patriotism and righteousness in good measure, and also enough megalomania to joke about later. Watch it if you want to forget the problems of your own country for a while. Be the first to comment on Jack Ryan: Shadow Recruit! Just use the simple form below. fullhyd.com has 700,000+ monthly visits. Tell Hyderabad what you feel about Jack Ryan: Shadow Recruit!